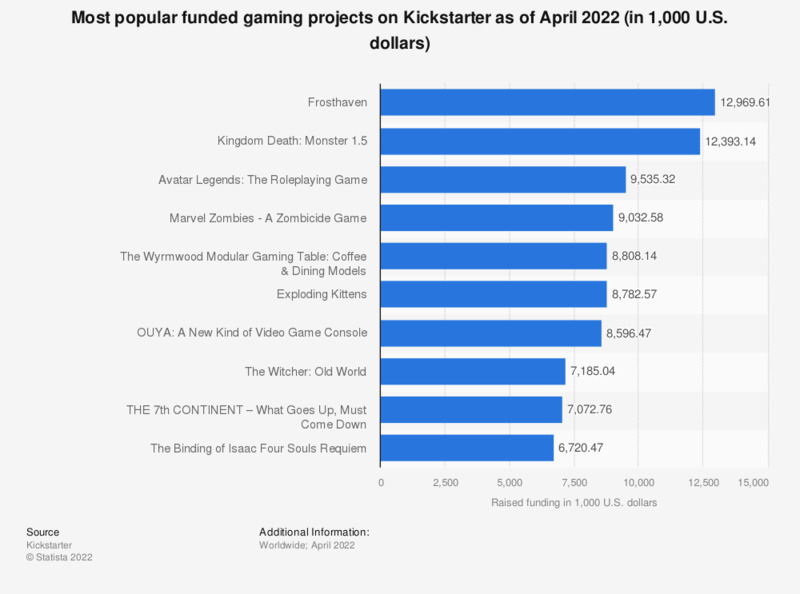 This statistic presents the most popular funded gaming projects on Kickstarter as of January 2019. As of that month, board game Kingdom Death: Monster 1.5 was ranked first with over 12 million U.S. dollars in project pledges. The Exploding Kittens card game was ranked second with more than 8.78 million U.S. dollars in completed funding. From July 2012 to October 2018, more than 3.9 billion U.S. dollars had been pledged to projects on the Kickstarter crowdfunding platform. *Converted from British Pounds using the USD GBP exchange rate of January 2, 2019. Every Kickstarter project must be fully funded before its time expires or no money changes hands. A project on Kickstarter is counted as successful when the funding goal has been reached within the given time limit.